Rivals Set Their Sights on Microsoft Office: Can They Topple the Giant? 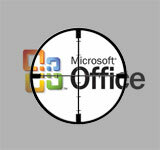 It’s open season on Microsoft Office. Google is distributing Sun Microsystems’ StarOffice, a rival productivity software suite, and also has its own web-based productivity suite called Google Docs and Spreadsheets. As part of its iWork suite, Apple has a new spreadsheet called Numbers that could compete with Microsoft’s Excel. There is also OpenOffice, an open source suite built on the same code base as Sun’s StarOffice, along with several web-based products — such as ThinkFree and Zoho — that have been eyeballing Microsoft’s turf. All of these rivals emerge at a time when Microsoft’s dominance in productivity software — Microsoft Word, PowerPoint and Excel — remains strong, with market share based on revenue of at least 95%, according to research firm International Data Corp. For the fiscal year ending June 30, Microsoft reported net income of $14 billion on revenues of $51.1 billion. Microsoft’s business division, which includes Office, reported annual revenues of $16.4 billion. Meanwhile, Microsoft is benefiting from a new product cycle as customers upgrade to Office 2007. So why are rivals targeting Microsoft’s Office juggernaut? Wharton professors suggest various reasons: Just shaving a point of market share from Microsoft, some point out, could be lucrative. Others note that strategically, rivals want to weaken Microsoft’s dominance any way they can. Still others point to the fact that good old-fashioned competition is alive and well in the technology industry, and Microsoft is a worthy opponent on many different fronts. Yet, even though Office is entrenched, Kendall Whitehouse, senior director of IT at Wharton, says Microsoft’s productivity suite is an easier mark than trying to beat Windows, the company’s operating system monopoly. “Microsoft Office may not be as unassailable as it seems,” he notes, adding that a product with a better user interface, less complicated options and the ability to read and write Office documents could put a dent in Office’s market share. Rivals are clearly hoping that their products will give them one more touch point to hook consumers, according to Werbach. For Google, it’s about selling more advertising. For Apple’s iWork, it’s about giving people another reason to buy an iMac. For others, it’s about selling software as a web-based service. The current crop of competitors to Microsoft Office differs compared to previous Microsoft challengers, such as Novell and Netscape. And that’s what makes them dangerous, Werbach adds. “The big players like Google, Apple and Sun don’t need to make money directly on the software applications, since they have other revenue streams.” In the end, these rivals can easily undercut Office on price, experiment and try to gain market share. “Microsoft’s competitors hope to change the economics of the productivity application market by essentially giving away these [suites],” Werbach says. For now, the game plan among Microsoft’s rivals appears to be to nibble at Office’s market share. Sun charges $69.95 for StarOffice as a stand alone product. The least expensive Microsoft Office version is $149.99 for the home and student version, with prices going as high as $679 for Microsoft Office 2007 Ultimate. Those prices are estimated retail prices, according to Microsoft. In addition, Apple on August 7 announced its new iMac, iLife 08 and iWork 08 suite. Apple’s iWork office productivity suite includes Pages, a word processor, Keynote, which is presentation software, and Numbers, a new spreadsheet application. In a statement, Apple CEO Steve Jobs called Pages and Keynote “incredibly easy” and added that Numbers “is far more intuitive and easy to use than anything else out there.” Numbers features enhanced charting, easier data sorting and tables that can be rearranged on the fly. Wall Street Journal personal technology columnist Walter Mossberg reports that Apple’s answer to Office is elegant, but less powerful than Microsoft’s version. iWork is $79 for a single user. According to Gartner analyst Michael Silver, productivity suites from Apple and Google aren’t necessarily designed to be Office killers. The goal is to take a small slice of a big market. “If you look at how much money Office makes for Microsoft, it’s a huge amount. It’s about augmenting. If you can get 1% of the market, or even one half of a percent, that’s a good business,” Silver says. He points out that “Office hasn’t changed much in the last 10 years,” a fact that opens the door for others to try to innovate their way into the market. “There’s room for a better mousetrap at some point. It’s about enabling users to work differently or better.” Whitehouse agrees. “Few consumers need all the features for Microsoft Office. For many people, ease of use is more important.” And, he says, that opens the door for a company like Apple, which has a proven history of creating consumer-friendly applications. The Linchpin: File Format Compatibility? Most of the alternatives to Microsoft Office, including Apple’s iWork and Sun’s StarOffice, can both open and save documents compatible with Office. Going forward, the ability to interchange documents among competing products may become easier as a result of an industry trend to establish public standards for document formats. For example, the state of Massachusetts originally dictated that all document formats would have to conform to an open source standard called the OpenDocument Format (ODF). Microsoft promoted its standard, the similarly named Office Open XML. Massachusetts ultimately decided to accept both standards. The adoption of one standard like ODF would make it easier for rival products to succeed against Office, notes Silver. While Whitehouse believes it is unlikely that a single standard will emerge, the fact that vendors are publicly documenting their file formats is a significant step forward. “Published document formats make it easier to reliably interchange documents and to create files that remain durable over time.” And, perhaps, they also make it easier to create software that can compete against the market dominant product. That strategy may be paying off. Microsoft chief financial officer Chris Liddell said July 19 that the company’s business division, which includes Office, will show annual revenue growth of 11% to 12%. “The first quarter will continue to benefit from strong customer acceptance of the Microsoft Office system,” said Liddell on Microsoft’s fourth quarter conference call.